In terms of your playing strategy, finding the right table to play at can make the difference between winning and losing your game. By extension, always sitting in the best seat at the table will give you a healthy rate of wins, too. In the following article I aim to talk about how to select the right table, what factors make a good and bad table and how to pick the best seat at that table. A great table is a table with multiple weak players or fish. Ideally, if possible you want to have position on fish. This will allow you to play pots in position against the weak players, you also get to isolate limpers and 3-bet there opening raises in position. The table above shows 3 weaker players, each has been identified by having a stack size smaller than 100 big blinds. Typically strong winning players will sit in with a stack size of 100 big blinds and have the auto reload function enabled. Seat 1 IE the seat highlighted as "the jesus seat" is the best seat at the table. 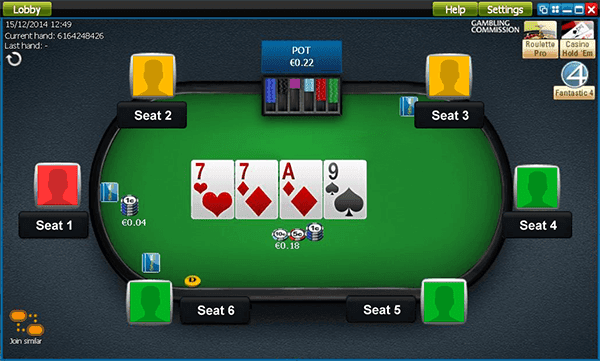 It is the best seat because this player has position on all 3 of the weaker players. The thing that makes this seat even more valuable is that the players to his left are both tight regulars. Ideally you want the tight players on your left and the loose players on your right. The worst seat at the table is seat 3. The reason for this is that the fish now have position on you and you will have to play most of your pots out of position against them. If I was seat 3 though, I wouldn’t be too bummed because this is an excellent table with 3 seemingly weak opponents. Any winning player should make profit from any seat located on a table like this. Most poker lobbys show you how many players go the flop. In general, the tables with the highest seen flop percentages are the juiciest tables. The reason for this is that in general winning players tend to play a tight aggressive style, whereas losing players tend to play a loose passive style. The higher the seen flop percentage the more likely there is to be multiple loose losing players at the table. This is an interesting statistic. A high average pot size basically shows that the pots played at the table in recent history have been large pots. Tables with multiple regulars tend to have low average pot size because most pots are won preflop or on the flop, unless multiple regulars have a strong holding you are unlikely to see large pots. However, fish tend to call alot of bets, so the pots tend to be larger. This indicator is not foolproof but is a fairly accurate indicator that a table may contain fish or is a soft table. If you combine the players to flop percentage with the pot size, if both appear to be relatively large compared to the other tables chances are it might be a good table. If there are multiple players on a waitlist, chances are that the table is soft because other regulars have spotted it and have gotten on the wait list. Try and get on the waitlist early because if you are 4th or 5th on the waitlist the chances of you getting a seat on the table before the huge fish busts his bankroll are slim. The best time to play poker is during the US evening hours from 5pm to midnight. Second to that are European evening hours 5pm to midnight. The reason for this is simple, most casual players have day jobs (Unlike us poker pros) and like to play for a few hours in the evening to unwind or for entertainment. Its also worth noting that Sundays tend to be the best days for playing both cash games and tournaments. Sundays bring a huge amount of recreational players due to the lure of a big score in tournaments such as "The Sunday Million". 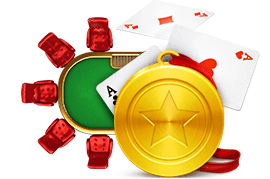 This spills over into cash games where you will also see a large amount of recreational players on Sundays.